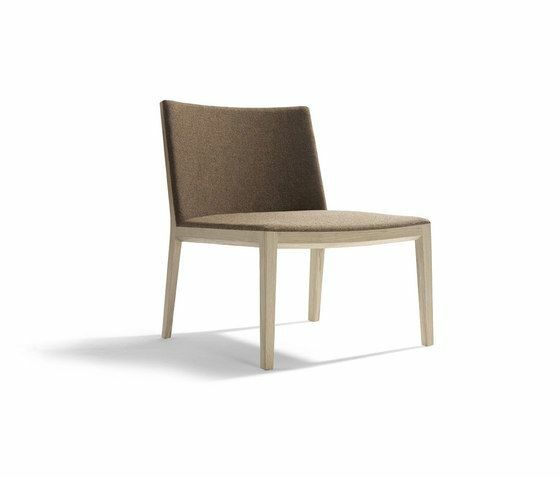 A reinterpretation of the Bianca chair designed by Franzolini in 2009, Bianca Light features the same shape but a lighter structure and slimmer lines. Bianca Light incorporates Crassevig’s distinguishing feature – curved wood – and exemplifies the company’s continual creativity in design. The chair’s seat consists of solid wood that gradually tapers and curves towards the edges. The back is available in wood, upholstery or skilfully woven leather. The XXL version, which features an even wider and more comfortable seat, is produced in neutral colours, making it perfect for communal areas and public spaces, such as waiting rooms and lounges. Chair with a solid wood frame and seat and back in fibreglass or Pral. Bianca Light The new Side and Extra Large Lounge Chair now complete the Bianca family, a collection of chairs in solid wood. They express the best tradition in the usage of this material, where work and finishes make the difference. The tapered shape lightens the structure, strong in the middle and progressively thinner towards the ends. Comfortable, strong, light: in these three words is contained the mastery of Crassevig, of which this family is an expression. The structure is in solid beech or oak, the seat and back are fully upholstered.